This report, completed in April, 2018, provides demographic and trend data about Minnesota district public school and chartered public school enrollments from the 2001-2 to the 2017-18 school year. 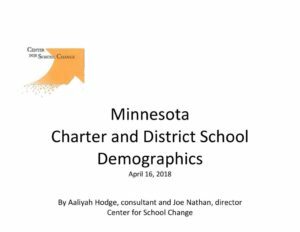 Enrollment and demographic data is presented for Minneapolis Public Schools, St. Paul Public Schools and the state of Minnesota. The data comes from the Minnesota Department of Education website. CSC has worked hard with MDE to verify accuracy of this data. But CSC is responsible for the data presented here. Reactions welcome.